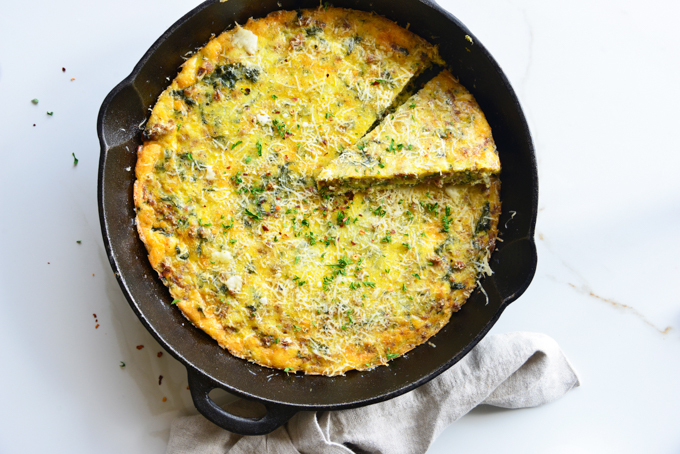 Baked Kale, Sausage and Cheese Frittata Recipe. So you’ve probably heard of a frittata, but that sounded like something that was too annoying to make and was maybe out of your cooking league. Well actually, frittatas are incredibly simple to make! 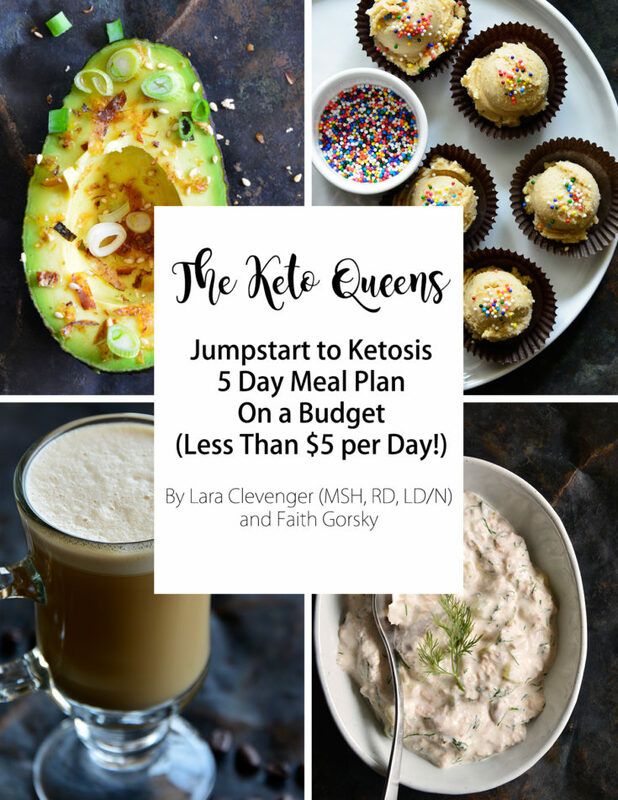 Who doesn’t love a super quick and easy keto breakfast? 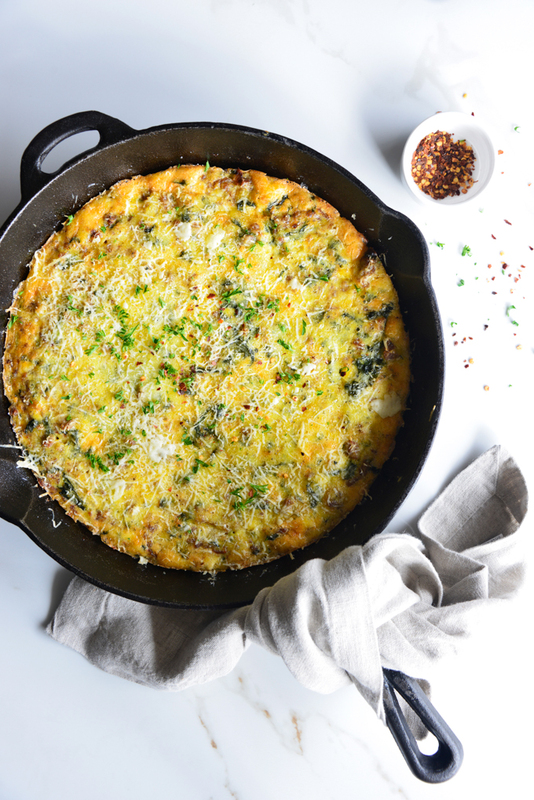 Our Baked Kale, Sausage and Cheese Frittata Recipe is just that!. 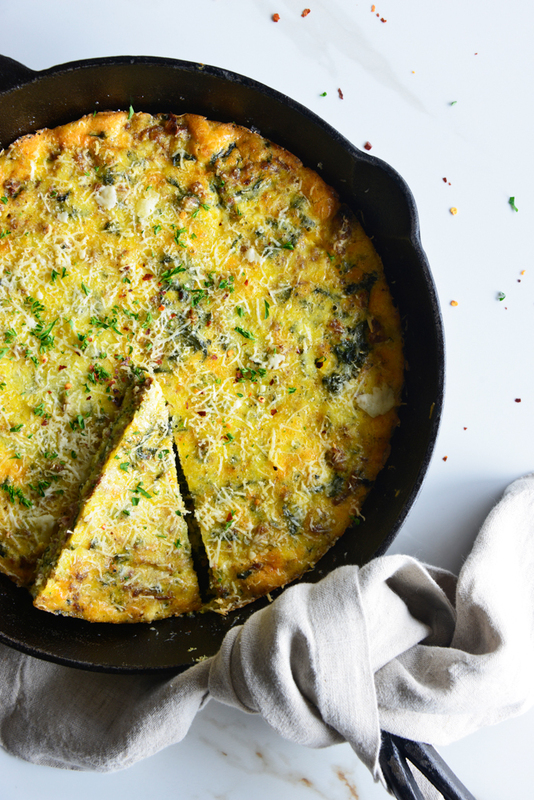 With only 5 minutes of prep time, this frittata is a quick breakfast option. 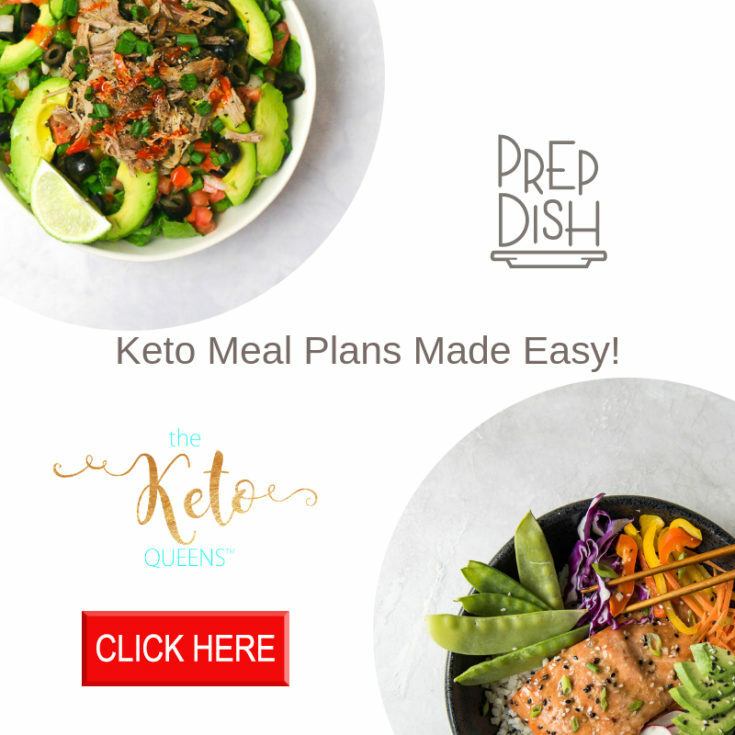 It’s great for keto meal prep too! Just slice the frittata into 8 servings (or whatever serving size you prefer). Pop the sliced frittatas into glass storage containers (we use these). Then store the leftover frittata in the fridge for up to 5 days. Simply put, a frittata is an Italian dish made by frying and then baking beaten eggs, often mixed with a variety of vegetables and/or meats. Think of an egg bake.. but fancier. First, preheat the oven to 350F. Then, heat avocado oil in a 12-inch cast-iron skillet over medium to medium-high heat. Once hot, add sausage, kale, garlic, black pepper, and crushed red pepper flakes, and cook until the meat is browned, stirring occasionally. Cool to room temperature. Next, lightly beat together eggs and Parmesan, and pour into the skillet with the sausage. Sprinkle extra Parmesan on top. Bake until the eggs are set, about 18 to 20 minutes. If desired, broil the top to brown it slightly. Then, sprinkle the parsley on top. Though they are both delicious eggy creations, omelets and frittatas have their differences. Omelets are beaten eggs fried only in a skillet, and folded in half. Frittatas are eggs fried in a skillet, and then baked in the oven, portioned, and served. Frittatas are not only good for you, but are also one of the most versatile foods EVER. Frittatas are a healthy protein and essential fatty acid egg base with nutritious vegetables, meats, and/or cheeses mixed in. 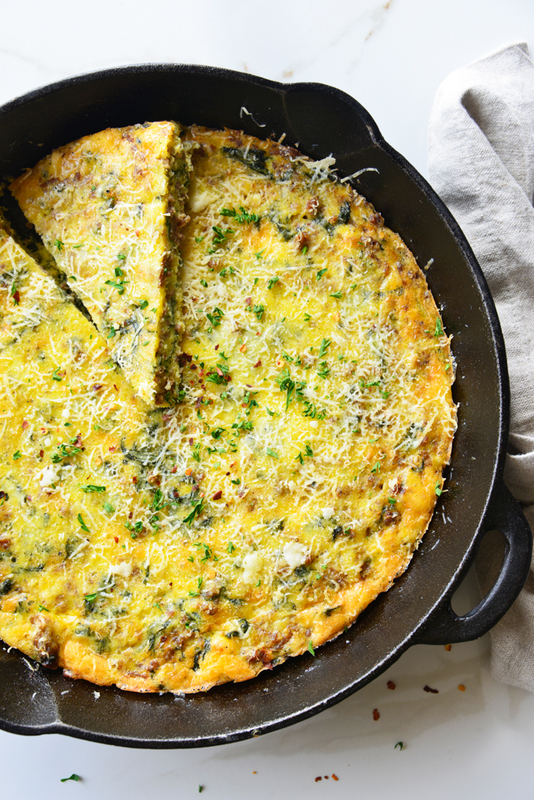 Toss in any of your favorite veggies or meats to make your own egg frittata recipe! 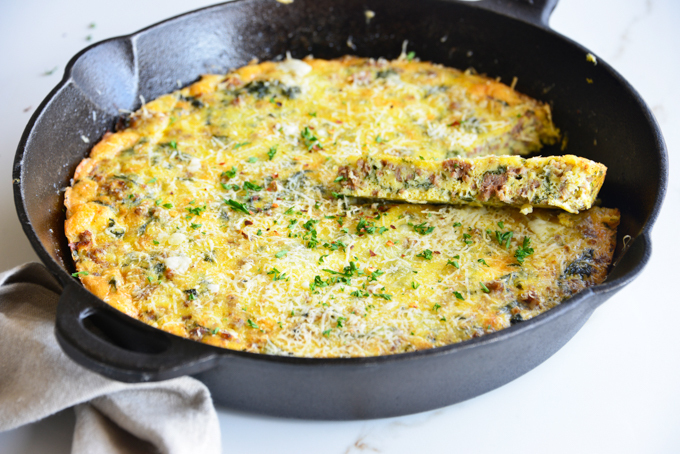 This easy frittata recipe would be great for breakfast, lunch, or dinner! 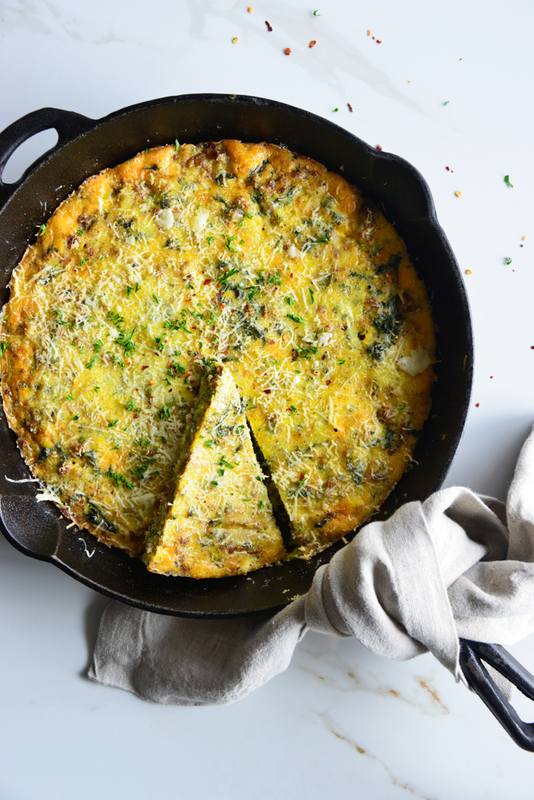 Just change up your side dish to tailor your frittata to any mealtime. Frittatas are great by themselves, but you can add sides if you need a little something extra! For breakfast, pair your egg frittata with some bacon, ham, or maybe even a small dish of full fat yogurt. For lunch, try pairing your frittata with a light salad with oil and vinegar. Finally, for dinner, have your egg frittata with a salad and/or a nice, hearty chunk of goat cheese! What’s a frittata made of? Does a frittata have a crust? No, unlike a quiche, a frittata is not made with a crust. Hell yeah, you can freeze a frittata. Just like our Low Carb Broccoli Cheddar Egg Muffins, you can toss your leftover frittata in the freezer and thaw it out when you’ve got a craving. Frittatas will be good for about 2-3 months in your freezer! 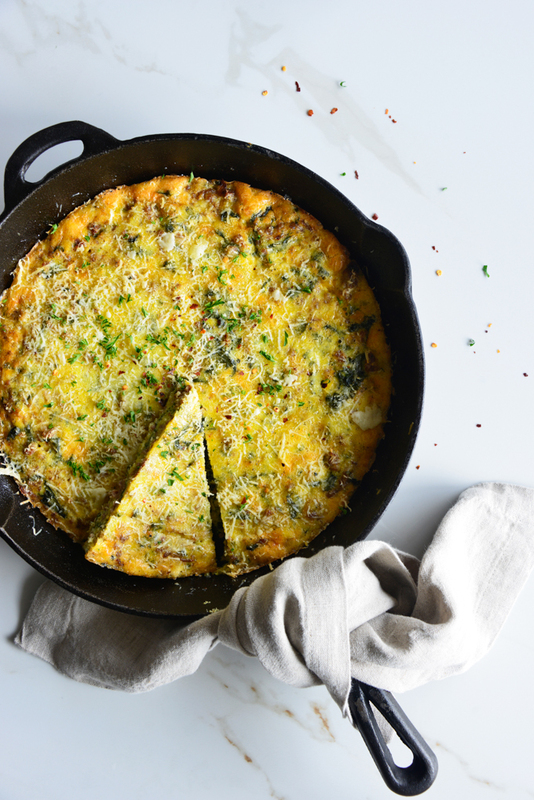 Yes, you can definitely make your baked frittata recipe the night before you plan to serve it. Just reheat it in the microwave or throw it in the oven for a bit until it’s warm all the way through, and you’re good to go. What’s the difference between strata and frittata? The difference between a strata and a frittata is that a strata is made with bread in the egg base. The bread in the strata causes it to puff up more than a frittata does. A strata is not naturally keto, but can be made keto if you use our keto bread recipe. What’s the difference between a crustless quiche and a frittata? 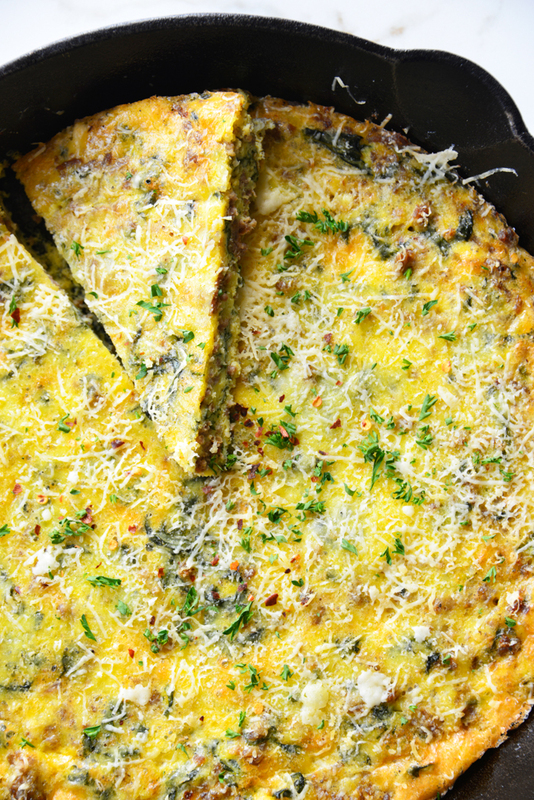 Essentially, a crustless quiche is the same basic recipe as a frittata. Really, the only difference between a frittata and a quiche is the crust, so when you take that away, they’re one in the same. 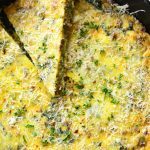 Check out these other low-carb frittata recipes! 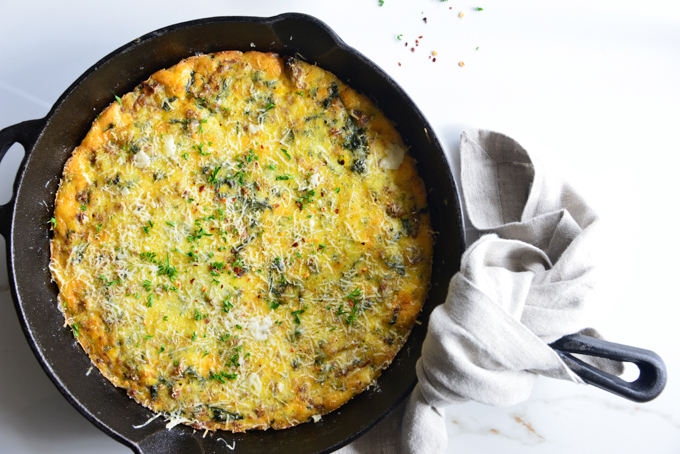 The best baked Kale, Sausage and Cheese Frittata Recipe is coming your way! So you’ve probably heard of a frittata, but that sounded like something that was too annoying to make and was maybe out of your cooking league. Well actually, frittatas are incredibly simple to make! Heat the oil in a 12-inch cast-iron skillet over medium to medium-high heat. Once hot, add the sausage, kale, garlic, black pepper, and crushed red pepper flakes, and cook until the meat is browned, about 8 minutes, stirring occasionally. Cool to room temperature. Lightly beat together the eggs and 3/4 cup Parmesan, and pour it into the skillet with the sausage. Sprinkle the remaining 1/4 cup Parmesan on top. Bake until the eggs are set, about 18 to 20 minutes. If desired, broil the top to brown it slightly. Sprinkle the parsley on top. If I don’t have a cast iron skillet, would it still work in a regular non-stick skillet? You’d have to use an oven safe skillet and most non-stick skillets are not.